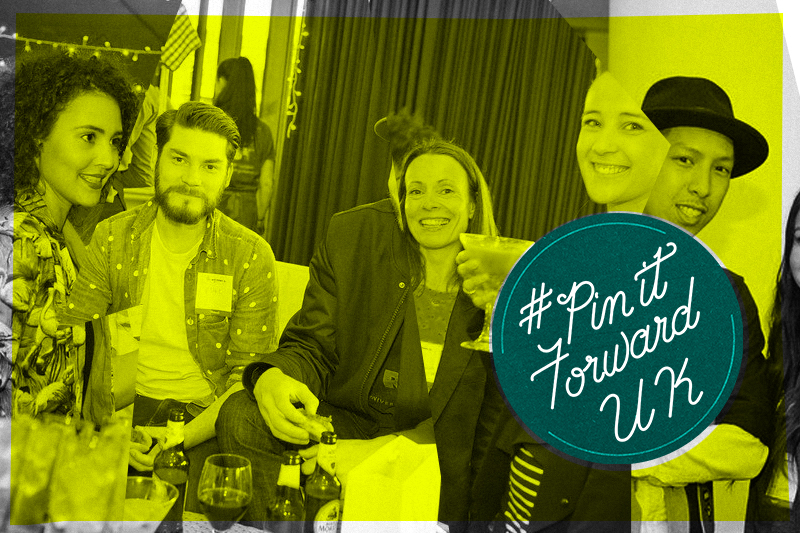 Pinning it Forward and some tips for new Pinners! You have probably seen "#Pin it Forward UK" on various blogs over the past few weeks, and today I'm delighted to tell you a little more about it, and also to say a big welcome to anyone visiting for the first time as a result of this fun initiative from Pinterest. My thanks also to Lindy of Lindy's cakes for my introduction yesterday! If you've been here for a while you'll know that I was a relatively early Pinterest adopter and have been "pinning" for over two years. For anyone who is still not sure what it is - quite simply, Pinterest is a tool for collecting and organising things that you love. Millions of people use the website and/or apps to plan projects, create mood boards, compile wish lists and keep a track of all sorts of things. It can be very inspirational and, in my case, quite addictive. I pin some things for my own future reference and some because I think people following the board might find them useful. I pin when I'm researching or planning a project, or just because I find something beautiful. My boards all have different raisons d'être - I currently curate 46 boards with over 2,800 pins. There are crafty boards (crochet, gorgeous knits, useful things, yarn storage to name a few) and other random things which are totally unrelated such as hairstyles, kitchen ideas and one board entitled "I just love it, that's all" which started out with a cute kitten and now seems to have become full of tattoos! Browsing Pinterest over the last cup of tea of the day has become a nightly ritual. You can join Pinterest here (using your email address or by linking to facebook/twitter). TIP: If you are linking to a social media account you may like to set your preferences so that your pins don't all post to your feed/ timeline which can be very annoying for your friends - especially if you become a frequent user! Once you have set up your account, search for people (or brands) you already like and 'follow' them so you can see what they have been pinning each time you log in. Use the search option to look up keywords, or if your interests fall into one of the pre-set categories (see image below) use that to browse for pins you might like. Click on any images you find interesting to go to the original website and if you like what you find, you may want to repin it for future reference. You can add a 'pin it' button to many common web browsers so that you can add things you come across whenever you are using the internet. 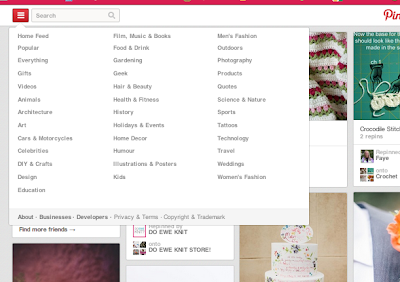 If you're using a Pinterest app and are looking for something in particular, you can also search the web from the built-in browser so it's easy to pin the things you find. Many websites have "pin it" buttons next to their products and articles - you can use these to add things to your own boards. TIP: If you have a blog of your own, you might like to make it easier for people to pin your posts by adding 'pin it' widgets to relevant posts (like I have, above). Pinterest is a great way of driving traffic to a blog and some of my recent posts have had a startling number of hits after being repinned many times. I could write about this all night, but that should be enough for starters and the rest will follow, which means it's now time to Pin it Forward! I'm going to pass the virtual torch to two lovely craft bloggers whose Pinterest boards you may also want to follow. The first is Jessica of Yiskah Knits - she has an absolutely beautiful blog full of all sorts of loveliness (knitting, food, various DIY tutorials...) and lots of great pins. Secondly, please say hello to Kate of Mini Eco - where you'll find lots of eco crafting, kid friendly projects, fun tutorials and printables. You can find Kate's pins here. Thanks for stopping by today - I have lots of posts planned for the coming week so stay tuned and happy pinning! Ohhhh...I am very familiar with Pinterest and is something I love to browse around last thing in the evening too. I just went over and clicked follow on your page! You have some gorgeous boards! I am a Pinterest addict too! I pin morning day and night and find the trends and social patterns as interesting as the actual visuals! Great article Sarah. Love the intro to Pinterest. I'm on Pinterest and love it. I've seen the logo for Pin it Forward UK but had no idea what is was about really. :) I'm so pleased they are making it easier for UK Pinners to get together. I love the Pinterest basics! I am relatively new to it so I appreciate it! I love Pinterest. It has organized ideas I'm interested in and makes it easy for me to reference bad.